The whole family will love this kebab recipe from Mel. 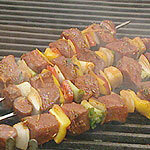 Mel said that the secret to good kebabs is in the marinade. The ingredients must be crushed to release all the flavours. He used spicy, Spanish-style chorizo sausage for extra zing, and colourful vegetables to appeal to the kids. 1. Mix the marinade ingredients together, making sure to crush them so that the flavours are released. Add the beef cubes and coat well with the marinade. Cover with plastic and refrigerate for up to 24 hours. 2. Place the prepared vegetables and chorizo sausage on a tray. Cover with a little olive oil and add the marinated beef. 5. Use tongs or a cloth to turn the kebabs. When the kebabs are ready, pull the handles of the skewers away from the heat to allow them to cool. 6. Serve the kebabs on a bed of fresh green salad. "There is only one nature - the division into science and engineering is a human imposition, not a natural one. Indeed, the division is a human failure; it reflects our limited capacity to comprehend the whole."